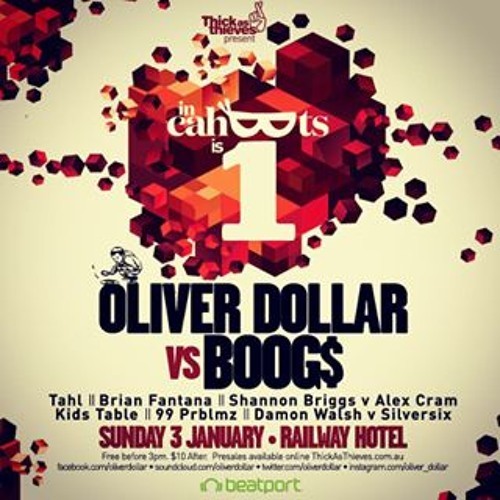 In Cahoots 1st birthday with Oliver Dollar vs Boog$ It's hard to believe its a year since our inaugural in Cahoots. In the short space of a year we have notched up some EPIC sunday evenings at the beloved Railway. As a special birthday treat, Oliver Dollar & Boog$ are going b2b for FIVE hours in the courtyard. Thank you for all your support in 2015. Looking forward to another year of dancing in 2016 and this is certainly a great way to kick it off! Whatever this is, I WANT MORE!! !